• On April 2nd, the Google+ account and any Google+ pages you created will be shut down and we will begin deleting content from consumer Google+ accounts. Photos and videos from Google+ in your Album Archive and your Google+ pages will also be deleted. You can download and save your content, just make sure to do so before April. Note that photos and videos backed up in Google Photos will not be deleted. • The process of deleting content from consumer Google+ accounts, Google+ Pages, and Album Archive will take a few months, and content may remain through this time. For example, users may still see parts of their Google+ account via activity log and some consumer Google+ content may remain visible to G Suite users until consumer Google+ is deleted. 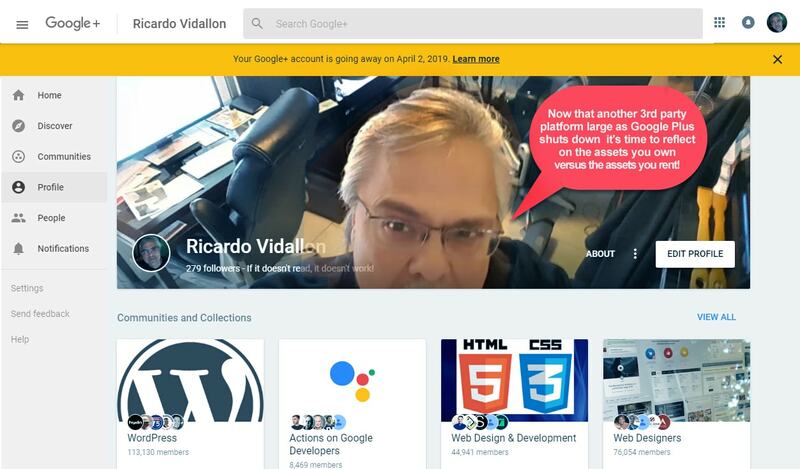 • As early as February 4th, you will no longer be able to create new Google+ profiles, pages, communities or events. Shutting down Google+ Take Away – If you don’t own it, you don’t control it. If you spend all your time and depend on a 3rd party application like those listed below to run your business, be sure you have a backup plan. Don’t put all your marketing eggs in one basket. Imagine investing all your time, money and hours in a social media/marketing application only to discover they are shutting down or sold to a different company. It has happened before and will happen again. Remember Yahoo? I am not telling you to avoid using 3rd party apps. Just make sure you do not totally depend on any 3rd party application to run your business. Be very careful how much time and money you invest in 3rd party apps. owned and controlled by other companies. The demise of Google Plus is a cautionary tale every small business person should remember. Own it! Don’t be a web tenant.